Desh Bhagat University, Best Private university in Punjab (2nd Rank, NIRF - MHRD Govt. of India) regularly engages the community in its endeavors to spread useful knowledge that helps people adopt healthier lifestyles. Desh Bhagat Hospital and Desh Bhagat Dental College jointly arranged free medical check-up camps at two different places. Pro Chancellor Dr. Tajinder Kaur inaugurated the camp organized at Gurudwara Rori Sahib, Village Chahal. 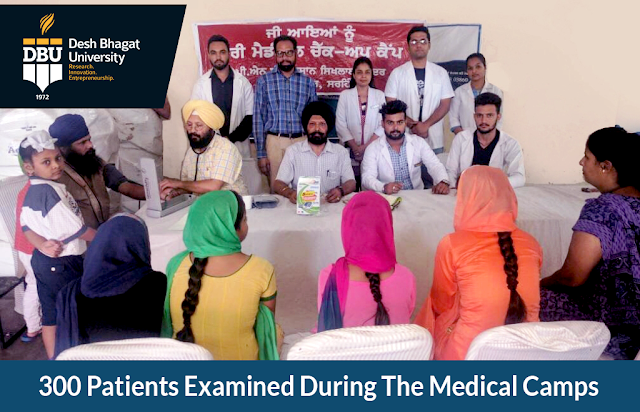 Here, the team of doctors consisting of Dr. Gulzar Singh (SMO), Dr. Baljeet Singh (CMO), Dr. Nishant Paika (Medical Officer) and team of Dentists Dr. Sukhpreet Kaur, Dr. Tarun and Dr. Kamal examined more than 100 patients. Earlier, the same team examined more than 200 patients at Gurudwara Guptsar Sahib, village Jassra. This camp was arranged in collaboration with PNB Farmer Training Center, Sirhind Branch. Director, Faculty of Ayurveda, Dr. Kulbhushan informed that the patients were examined and given necessary medical assistance. Medicines were provided free of cost and some laboratory tests were also done free of cost during the camp. The medical teams also advised the people about healthy eating habits, avoid eating overripe and unhygienic fruits and also keep away from junk food. The dental doctors gave demonstration to masses how to use toothbrush and to do it regularly before going to bed. 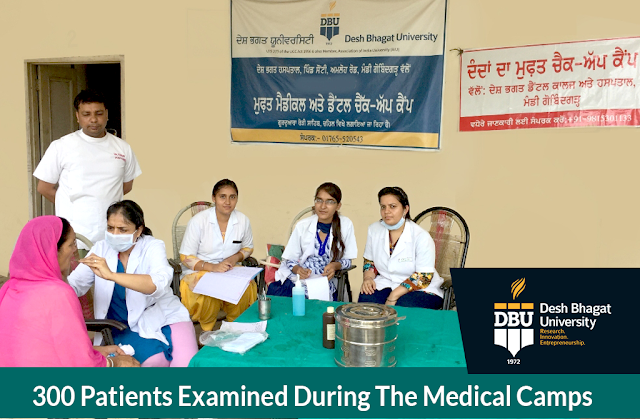 Desh Bhagat Dental College Principal Dr. Rajiv Bali said that the patients were highly pleased and contented with the treatment and facilities provided by DBU during the medical camp. University Chancellor Dr. Zora Singh appreciated the doctors for their services and appealed to the people to get maximum advantage from the services being provided by Desh Bhagat Hospital and Desh Bhagat Dental College.